“Rev. Anderson gave the best years of his life to Taiwan and he loved Taiwan more than Taiwanese people do,” said PCT General Assembly Clerk, Rev. Lo Jen-kuei, on behalf of the PCT General Assembly at the late Rev. Boris Anderson’s memorial service held in Darlington, UK, on April 26, 2013. His sentiments were echoed by those who were attending the service and who knew Anderson personally. Rev. Boris Anderson passed away on April 15 at the age of 94. His memorial service was held on April 26. 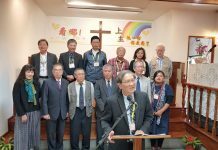 The PCT delegation that attended Anderson’s memorial service included Lo and Tainan Theological College and Seminary Dean (TTCS) Cheng Chang-fa, Taiwan Church News General Editor Fang Lan-ting, and PCT Ecumenical Committee member Pan Li-ju. They had all come from Taiwan to pay respects and convey their gratitude to Anderson on behalf of the PCT. In addition, Carys Humphreys, the PCT General Assembly Office’s English administrative assistant to the General Secretary, and Joyce Shih, the administrative assistant to the PCT Ecumenical Committee Secretary, also traveled to Darlington from Wales where they were spending their holidays to attend this service. Furthermore, the son and daughter-in-law of former TTCS President Shoki Coe also attended the service. Shoki Coe and Boris Anderson had been close friends and colleagues in the days Anderson ministered in Taiwan. This group of visitors whose special connection to Taiwan enabled them to speak in Taiwanese soon began to greet one another and chat. Cheng Chang-fa, who teaches New Testament at TTCS now as Anderson did long ago paid respects to Anderson on behalf of TTCS. 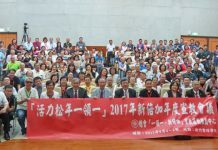 He praised Anderson’s outstanding contribution to Taiwanese education and Taiwanese theology and added that TTCS would hold its own memorial service for Anderson on May 25. Anderson was an instrumental figure and helper when the Kaohsiung Incident took place in 1979. At the time, supporters of Taiwan who resided abroad supported Taiwanese democracy through various means. Anderson and his friends in the UK gave some live recordings of what was happening in Taiwan at the time to Amnesty International and they worked closely with Rev. Lo Chung-gi (Lu Jun-yi), who was studying in the UK at the time, to translate these recordings into English so that the rest of the world could know the truth of this tragedy and thus protect those who had been thrown into prison as result of political persecution. Their efforts eventually hastened liberalization and democratization in Taiwan as pressure was placed on the KMT. PCT delegates attend Boris Anderson’s memorial service. A close-up photo of the late Rev. Anderson.